← SHILOH, GETTYSBURG and ANTIETUM REMINISCENCES. Trichy Sankaran and his Kanjira meet a North American drumming tradition. 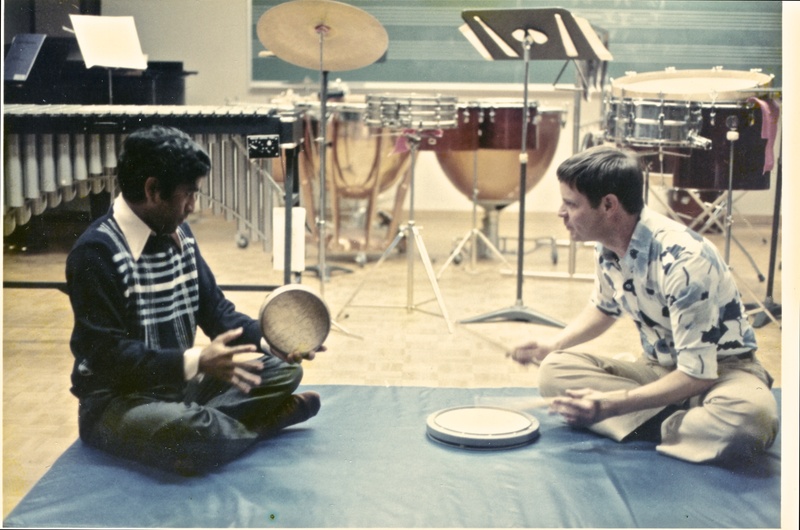 In 1972 I began teaching music improvisation at York University in the city of Toronto. The course was elective and the students were from various faculties on campus such as physical education, dance , English and music among others. York University offered a music program very much different from other traditional music schools. Austin Clarkson was our Dean and musicologist; David Lidov taught composition; Peggy Sampson, a viol player, taught Early Music; David Rosenboom was the head of the Electronic Music Studio; Casey Sokoll taught Theory and Piano; and John Higgins taught Indian singing. 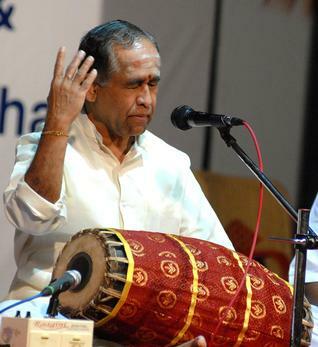 Trichy Sankaran was teamed with Higgins and taught Mridangam, a two headed barrel drum common to South Indian music. But the way Trichy played, the Mridangam was not at all common. Trichy was born in 1942 and began studying Mridangam ten years later. Trichy was in his 30th year when I met him. He was a recognized master musician. Today he is a legend. Perhaps it was during a faculty meeting when Trichy and I first met. At sometime we must have asked each other if there was any music we could play together. Very much intimidated, I suggested a few military drum beats that I knew quite well and thought he might be interested in hearing. The famous British/American Reveille or wake-up drum beating would probably be a good start. Trichy came to the percussion studio and we began playing Three Camps. Trichy memorizes everything so I would play the 1st phrase, he’d play it back, asked me to play it again and so on. Given his tradition of memorization, it didn’t take him long to memorize the entire beating. It was a lot of fun and a heck of a learning experience, more for me I suspect, then for him. He played Kanjira, a small Indian tambourine and I played on a practice pad. Trichy is recognized as a master soloist on Kanjira as well as Mridangam, his primary instrument. A few months later we performed Three Camps on an informal student concert. Trichy and I had another wonderful moment a year later during a faculty Christmas party. Trichy had brought his Kanjira and I had a Western tambourine. We began playing softly in a far corner of the room and there occurred one of those meetings of the mind. We just got in a groove and created some really incredible music. It ranged far and wide in tempo and rhythmic complexity. Without meaning to, we kind of stopped the party. Conversation ceased and people around the room were listening. In music, moments like these are rare and unforgettable. Many years later I had the pleasure of playing a solo at a party celebrating the wedding anniversary of Austin and Beverley Clarkson. To begin the festivities, Austin asked me to come to the podium and play a flexatone solo. This was a complete surprise. Rather reluctantly I made my way among the tables of guests. Austin handed me a Flexatone and stepped aside. Just before I began to play I looked out over the guests directly into the eyes of the master, Trichy Sankaran. What in Heaven’s name am I doing and what will Trichy think? I played a brief Flexatone sonata and all went well. I was quite pleased and relieved. Trichy and I remain good friends to this day though we rarely see each other. He is often in India and is a thoroughly dedicated teacher. When I think of him, the early, more naive experiences we shared are my fondest memories:Three Camps, our impromptu Christmas party duet and a Flexatone solo. Trichy has always been a gentleman. He is also a gentle man within whom dwells a lion’s spirit. Trichy and me learning “Three Camps” on Kanjira and practice pad at York University ca. 1972-3.